Cornerstone is not a theme that is generally available to Aurora users. Rather, it was designed to be a starting point or a parent theme for all future themes produced by the UITS Web Development Lab. It is also made available to registered Aurora developers. 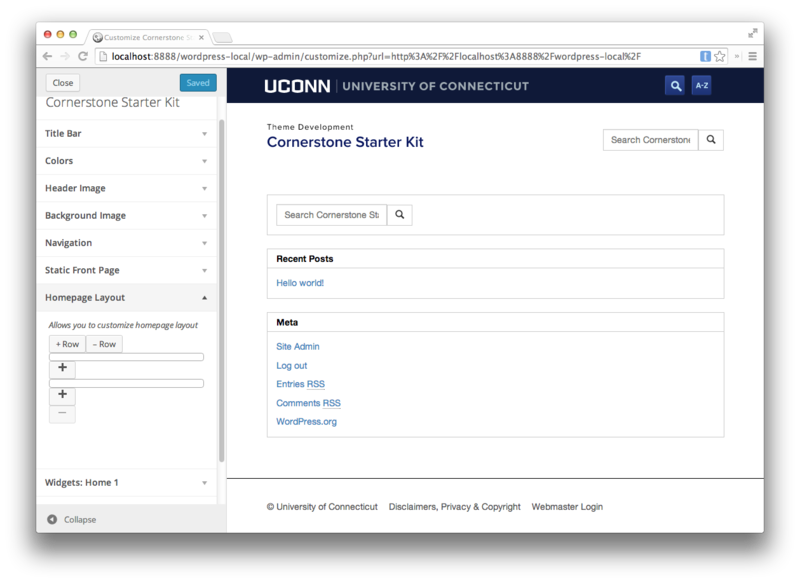 This page is meant to help those developers in using Cornerstone for their own projects. Cornerstone was designed from the ground up to be developer-focused. It’s based on the the WordPress _s (‘underscores’) theme mixed with Bootstrap 3. The design philosophy is to enable and turn on every feature we can think of in Cornerstone, and then child themes will need to unregister the features they don’t support. 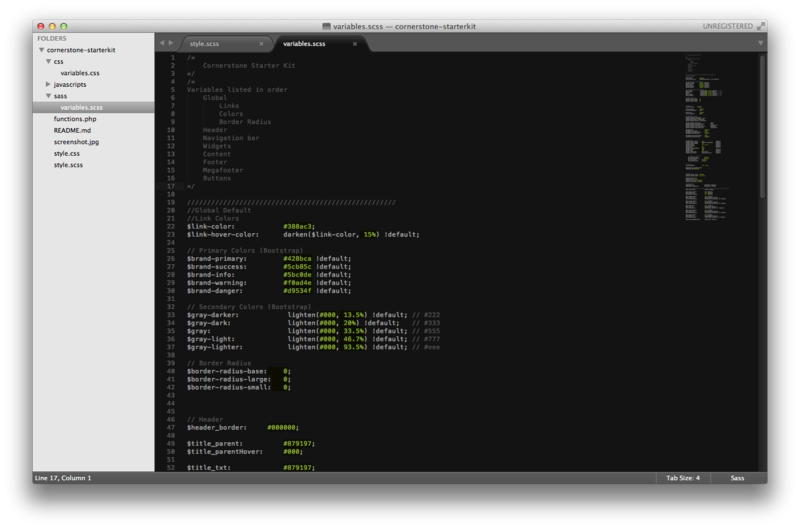 For example, Cornerstone can support header images, background images, and background colors. 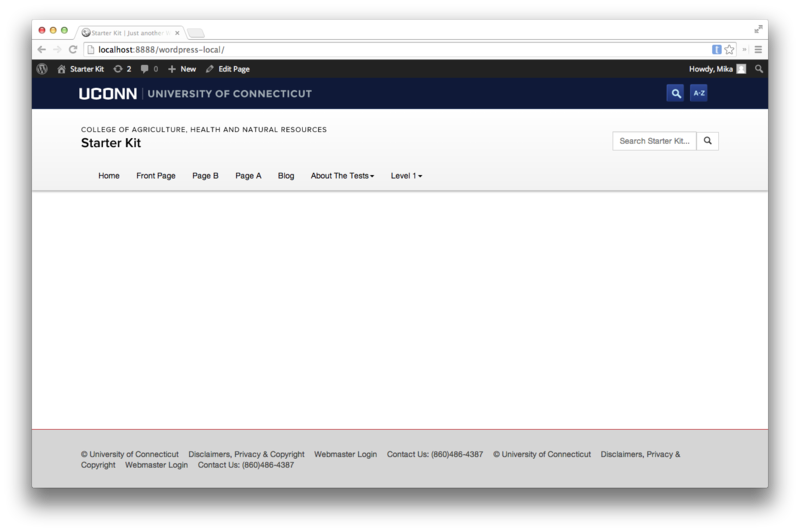 However, we may not want those features turned on when the site is being administered by someone less familiar with University Brand standards or web accessibility policies regarding color and contrast. The following is a list a child themes that already use Cornerstone. These themes were developed at the Web Development Lab and best show how versatile Cornerstone is. 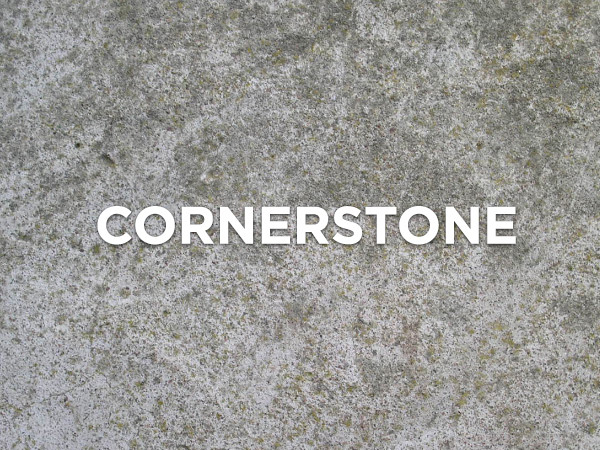 Cornerstone is a bare-bones theme created to be developed upon. It is possible to create your own theme built upon cornerstones structure. We welcome you to play with the sources files. 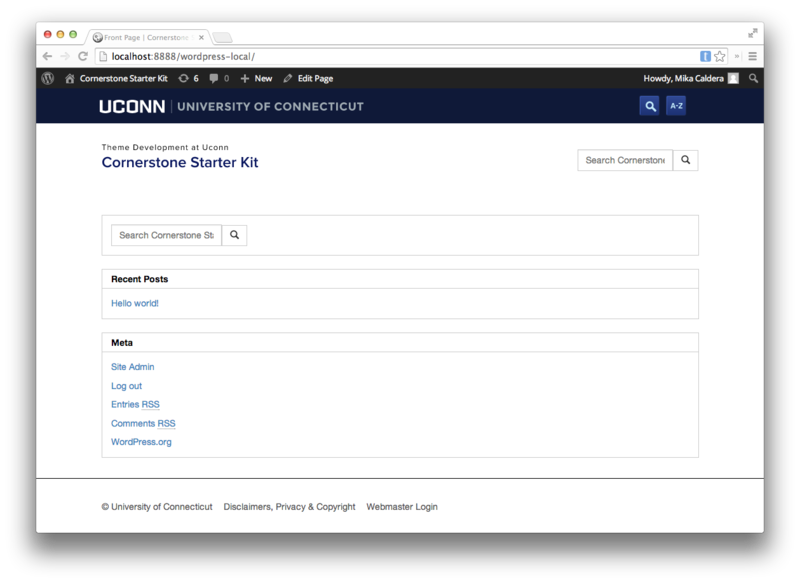 The Cornerstone Child Theme Starter Kit is available to help developers get a new project running quickly. You can access it on GitHub. Cornerstone basic mode on customization screen. Cornerstone is built with SASS, and if you build your child theme with SASS, you’ll be shocked at how fast you can make a ton of changes. 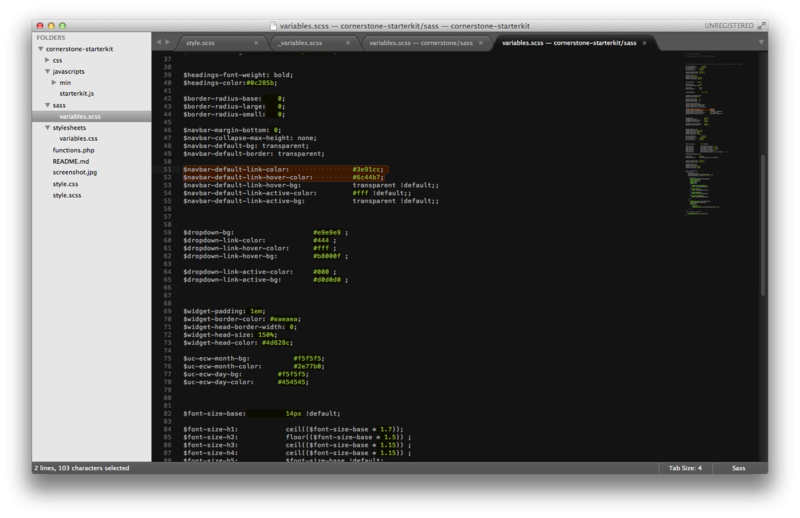 Though you are able to use CSS, Cornerstone was optimized for SASS. To begin you must create the basic file structure like any other WordPress child theme. Below is an example. UITS has already compiled a starter kit for you in your sandbox. The SASS variables available to you come from three possible documents. Cornerstone registers a large number of new variables mostly pertaining to navigation and widgets. 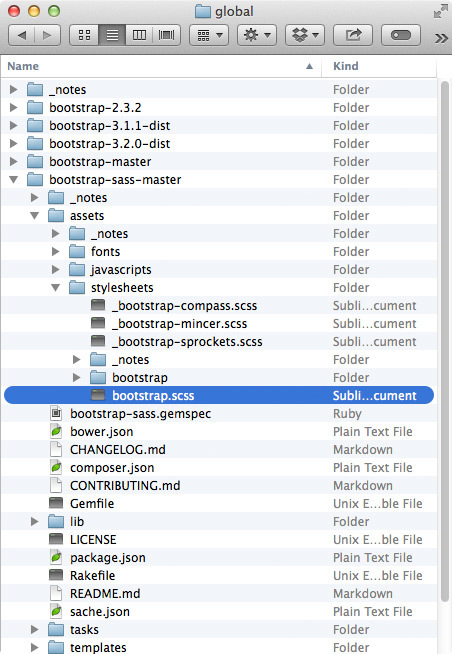 This is the pre-compiled Bootstrap scss in the global directory, and it has hundreds of variables. 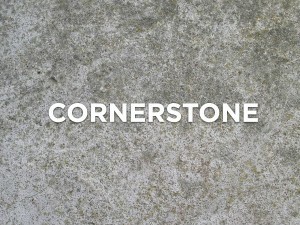 Cornerstone registers a large number of new variables, mostly pertaining to navigation and widgets. Sherman, a child theme built with SASS, can redefine any of the variable in Bootstrap or Cornerstone before they are compiled. Rather than wrestling with a dizzying number of selectors and tracking down every single place a single color or font may be referenced, you can edit a few variables and be 80% complete with your redesign. It’s fantastic! 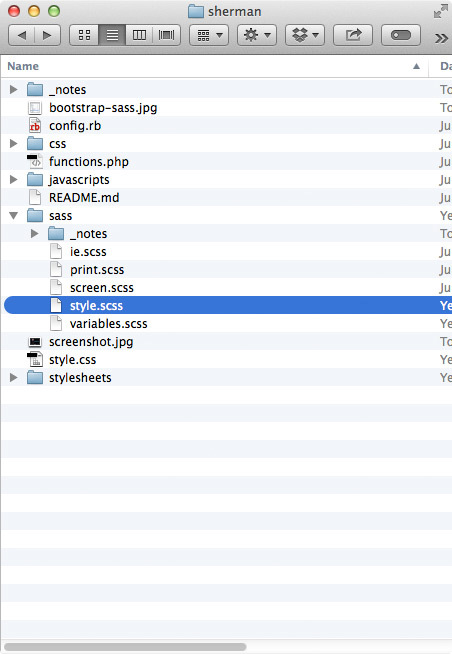 In order to make changes, you will have to edit style.scss using the SASS variables. You will also need a SASS compiler. A common one is PREPROS. Once you have a general understanding of the variables and the file structure you can start editing variables.scss. 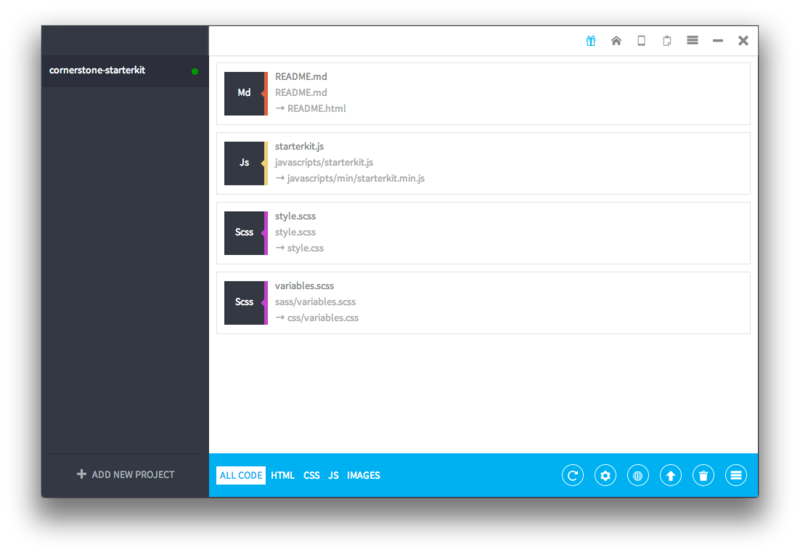 This file contains listed default variables from both Bootstrap and Cornerstone. A change is simple: search for your target tag and change the attribute to whatever you would like it to be. To change the default link color for the navigation bar you would have to scroll down to the “$navbar” variables and make the changes you would like. Variables we will be changing. The hex codes would be located here. Look before any changes have been made to variables. Look after changes have been made. Now, the navigation bar links are light blue! 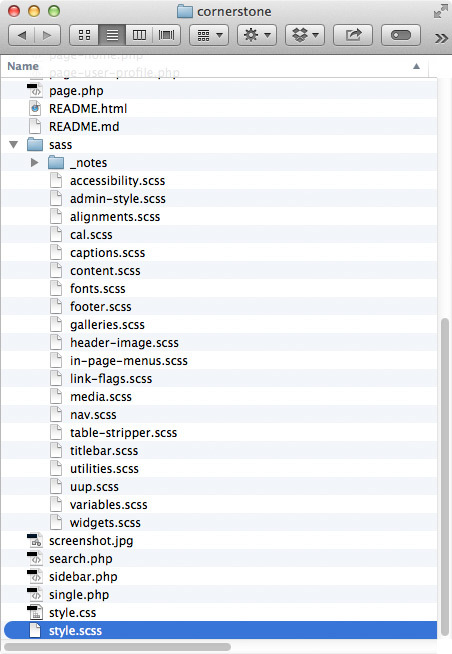 In order to edit the style of your theme you will need to edit it using SASS in style.scss. Variables do not go in style.scss. Below is an example of how you can change the style of your theme’s master header. Header before a style change. 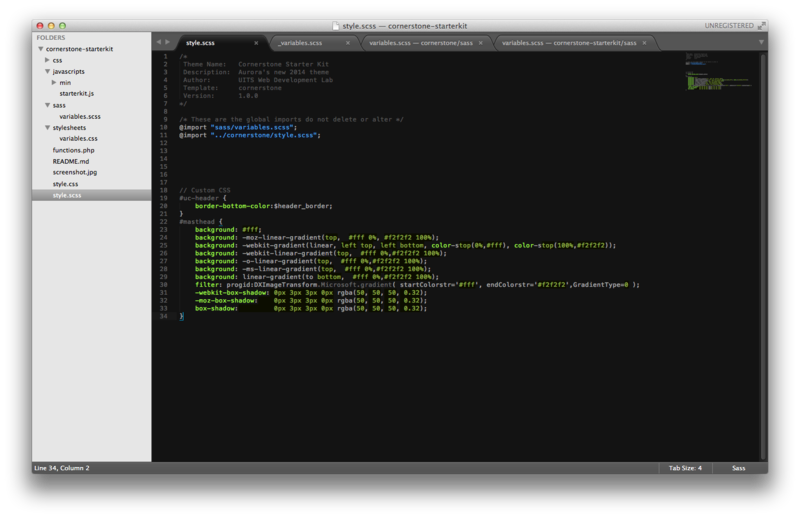 Theme after style.scss change has been applied. Cornerstone was built with SASS, but you can still develop with normal CSS. Don’t use @import in your CSS file, or your site will break in IE8. Typically, a child theme will @import the css of the parent theme. Bootstrap 3, the framework which Cornerstone is based on, offers very limited support for Internet Explorer 8. By default, a Bootstrap 3 site in IE8 will render the mobile view. One column of content, and the collapse mobile navigation. Child themes are a way to take an existing theme, such as Sherman, and change a couple of things about it. For developers looking to create something custom, we highly recommend looking into child themes first.